You are a good manager. You get how important employee onboarding is. And you would love to do it well. But deadlines are hurtling towards you at an alarming rate. There seems to be one crisis after another. Your team are working flat out just to keep their heads above water. When you get new hires in, you just need them to take on some of the load as soon as they can. The experts are right when they say that onboarding should be a priority. But right now so is that big launch next month, or that sales bid submission or that customer go live. It is hard to prioritise onboarding when it is competing with activities that have dates that are set in stone. Unfortunately it is the crazy busy teams, just like yours, that really need to onboard employees well. Because if you don’t, they are way more likely to leave. And you don’t want to start that hiring process all over again, do you? So how on earth do you do it all? 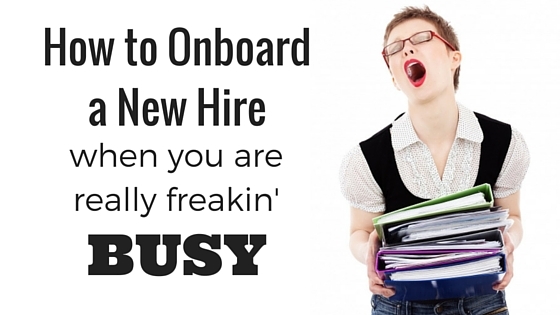 How Do You Onboard New Hires When You Are Just So Busy? The answer? Nothing is easy when you are that busy, but it can be done. And you really have no choice. According to the Wynhurst Group, 22% of staff turnover happens in the first 6 weeks. This period is critical. Keeping your fingers crossed is not a proven strategy for keeping the great talent you worked so hard to find. It makes them smarter, faster. By teaching your new hire about the business, and not just their job, you give them purpose. They understand why they are doing what they are doing, the impact they have on others and the part they are playing in making the business successful. “New employees that went through a structured onboarding programme were 58% more likely to be with the organisation after 3 years” Wynhurst Group. I know. Statistics are one thing. Getting it done is another. Here’s the secret. You don’t need to finish onboarding before your employee starts becoming the productive superstar you are hoping for. 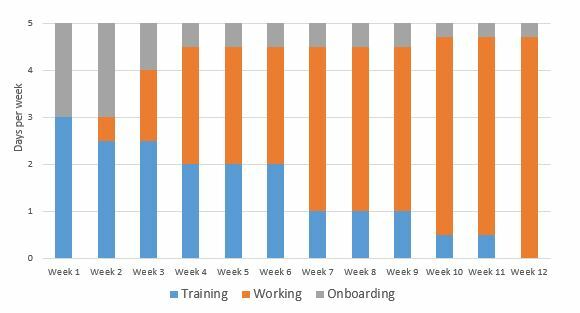 Have you ever heard about 90 day onboarding programmes? You rolled your eyes didn’t you? With an ‘as if’ look on your face. And you might have muttered ’90 minutes would be good right now’ under your breath. You can concentrate on getting your new hire up to speed on the job he has to do. The trick is to shave off a few hours a week to focus on onboarding your new hire into the business. The split of hours will be different for every job, but you get the idea. In this example, you start off devoting two days in the first week to showing your new hire the bigger picture and that reduces down to a couple of hours a week by the end of week twelve. Depending on the size and complexity of your business, you may not need twelve weeks. There is obviously a long list of things you would include if you weren’t running at the break neck speed you are. This is not meant to be the ultimate onboarding plan. But, when you are in this crazy busy place, it will be a lot more successful than just keeping your fingers crossed. The actions below are in bite-sized chunks. They will be quick for you to plan and schedule and easy to fit into the time you have set aside each week for your new hire. Schedule items from the list in advance so their calendar is full when they arrive. Schedule a one hour meeting with him for Day One. This is important to……. Walk him through the product/service lifecycle (or schedule in time with someone that can) Who designs it, makes it, delivers it, supports it. Help him out with the acronyms and company jargon. Let me leave you with a word of caution. Best intentions do not create the experience you are looking for here. Your best actions do. Here are five rules to ignore at your peril. Give your new hire a list of what their onboarding will include. This means that even though you are staggering it over a few weeks, they know it is coming. But the most important thing about helping your new employee thrive, is the way you make them feel. Find patience even when your stress levels are high. Concentrate on making them a valued member of your team. Help them feel like they have made the right decision to join you. I know you are busy, so I thought this might help. Click here to download three templates to save you a bit of time in your manic day.